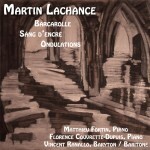 Martin Lachance is a Canadian composer from Quebec. His works have been performed in Portugal, Brazil, China, the United Kingdom, the United States and, of course, in Canada. His passion for music showed itself initially when he began to study piano and it eventually grew into an endless curiosity about the vast repertoire of piano music. He studied piano with Michele Royer and Marc Joyal in Quebec and later completed his Bachelor’s degree in performance with Jean Saulnier at the University of Montreal. After studying piano, he turned to composition and began composing for film. His first soundtrack was written for the film Les Voleurs d’eau by Sébastien Élias and was well received internationally. Following the success of this soundtrack, he began receiving commissions for similar projects. In 2003, he won the award for Best Original Score at the Persistence of Vision Film Festival in Vancouver for the film Our New Toy by Lawren Bancroft-Wilson. After a few years spent mostly composing film music, he decided to study composition more seriously. He returned to the University of Montreal to complete a master’s degree in composition under the direction of Alan Belkin. Since 2012, Martin Lachance has focused mainly on the composition of concert music.